In a recent blog, we discussed a normal diastasis gap, a naturally occurring separation necessary for the function of the abdominal wall. Growing in our understanding of what is normal or natural before having children, can help us establish more appropriate rehabilitation and fitness expectations, programs and goals for pregnancy and pregnancy recovery (please read this discussion of “normal” first before diving in here). We have raised concerns and fears for moms with online messaging that everyone has a diastasis in pregnancy and postpartum. While women do develop an abdominal separation as a part of the pregnancy process, not all women retain a diastasis gap post-partum. Approximately 2/3 of women return to a gap1,2 near their normal baseline measure, while approximately 1/3 have a larger retained gap, fascial (linea alba) and abdominal wall dysfunction3. 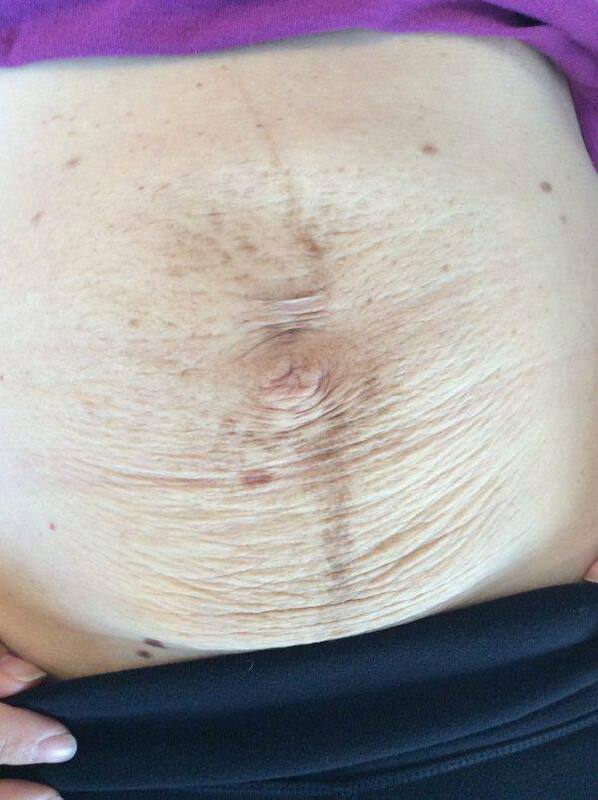 But is a 4* cm diastasis gap, the same type of dysfunction as an 8* cm? The answer logically has to be no, but we have no language around how to delineate the needs of these two different presentations. Distinguishing between a diastasis that we are more concerned about and one that we are not, is our next task. I am going to share some ideas from my clinical experience and observations, which represent my attempt to apply the research and innovate to help my patients. But please as I share, it is important for you, the reader, to understand that when I evaluate these markers they represent a point in time for my patients. I see them at the beginning of a time line, and where they start doesn’t necessarily predict the outcome. I have been happily wrong about some women that I had larger concerns about initially, and sadly wrong about some of the women I had higher hopes for. So if you read this and think “aw, crap, she is describing me and my belly” please don’t let that discourage you. I have been able to help women make significant improvements in fascial tension and diastasis gap width, maintain and accelerate their fitness even with an initial presentation of a very large diastases and very thinned fascia. They have done remarkably well! Defying what we think we know, with responses to care that totally blew my mind. It has allowed them to continue to exercise between pregnancies, and helped them prepare for diastasis surgery. I wouldn’t suggest surgery to anyone until they had a very good course of conservative management and they had exhausted all options (at least a year). But for some women, surgery is the best option, and it is not defeat. It is the progression of a course of treatment and one of the options we are lucky to have should a woman need it. The goal here is to help women see themselves on a continuum vs all being lumped into one fearful, extreme. What are some of the characteristics of a diastasis that raises my concerns vs one I have lower concerns about? Skin. Skin, like fascia, is also a type of connective tissue. The status of the skin on the outside, can be an indicator for me of the quality of an individual’s connective tissue density and resilience on the inside. We think this is influenced by genetics, and collagen type. A woman that has very stretched out skin appearance, I often find that she has similarly thinned fascia in the gap. I am not referring to stretch marks, these are very big skin changes (see pic). When I evaluate a mama, the big reveal of her skin appearance when she lifts her shirt for measurements is a big moment for me as her clinician. With big skin changes, I have found bigger challenges for restoring tension capacity in the fascia. Responsiveness of the fascia. This is the most indicative sign for me to determine my level of concern for a patient. If I can get your fascia to respond with tension to some sort of challenge…I am super psyched, no matter the size of the gap. Our best guess is that genetics seems to play a role in fascia that is more responsive and develops tension again vs one that does not. That is an X-factor that none of us can control or predict. I test the fascia to help me understand if it is responsive vs unresponsive out of the gate. First, I have mama’s do a small head curl-up (without any cueing) to see if the diastasis gap closes and the fascial tension increases. Often this will create closure but no tension increase in the fascia, and there is often a gully behind the gap. I then cue mama to exhale prior to raising her head (I call it “Blow before you go”). This is a trigger to stimulate the activation of the deep system of muscles. These muscles have relationships with and create tension in the fascia. If the patient generates more fascial tension with ‘Blow before you go’ cue, then I consider the fascia “responsive” and I am encouraged. Some mamas have areas along the linea alba that are responsive to this test, and areas that aren’t (often around the navel). This gives us areas to focus on. If they have no change in the tension in the fascia with Blow before you go, this is not as encouraging. I often create more of a challenge (lift head and shoulders for example) to see if more oomph in the test will create a response in the fascia). If a variety of movements coupled with Blow Before You Go doesn’t trigger fascial tension, then I have larger concerns for that mama. But I still work to create tension coupled with whole abdominal wall activity over time (via a global program). I don’t give up easily! How does their abdomen behave in function? We need to see and feel how their abdominal wall, current stability strategy, fascia, and gap behave in an upright activity. Single leg squat is a component of both functional and fitness movement patterns and it is my favorite test to see how well a mama can stabilize through the trunk/pelvis/hip. If the single leg squat is poorly controlled at evaluation (pelvis drops, torso shifts or rotates over the stance leg, and/or the stance leg falls to the center), it indicates poor proximal trunk and pelvic control. As we rehabilitate, single leg squat is my ongoing measure of how well they are regaining whole abdominal wall function and integration of the abdomen with the rest of the trunk control system. This will speak to how well the linea alba can communicate force between the sides of the abdomen, and trunk to pelvis and hips. But please hear me, if a mama has an initial presentation that is of higher concern, it does not negate that they can improve, nor does it negate that they should and can exercise. It is our job to help them do it safely and be aware of symptoms or how the diastasis may affect their ability to control the center. Many women have an unresolved diastasis and less dense fascia but plan to have more children, and need to wait for surgery until they have completed all their pregnancies. They don’t want to wait to exercise until after surgery and they want to exercise during the pregnancy. So we address this with a solid strategy of restoring central abdominal control, link it to its teammates for postural control, observe how they are moving, and critically think through how to address inefficiencies just like every other injury. I hope we can begin to have a conversation in the community around delineating diastasis severity to reduce fear and target our education with context. *These are resting measurements vs closure measurements. Don’t wanna miss a post? Join my newsletter here! Exclusive content for subscribers coming soon. Boissonnault J, Blaschak MJ. Incidence of Diastasis Recti Abdominis During the Childbearing Year. Physical Therapy. 1988; 68: 1082-1086. Lee D, Hodges PW. Behavior of the Linea Alba During a Curl-up Task in Diastasis Rectus Abdominis: An Observational Study. J Orthop Sports Phys Ther. 2016; 46(7):580-9. Q and A: What is the Goal of Prolapse Rehab? Fantastic like always. Julie your willingness to share, clinical experience and presentation of information is beyond great. As a PT I am sometimes unsure of what exercises to prescribe to support a return of function. I really like the idea of the single leg squat as an outcome measure, and in some cases I imagine it becomes the homework. This blog provides general information and discussion about medicine, health and related subjects. The words and other content provided in this blog, and in any linked materials, are not intended and should not be construed as medical advice. If the reader or any other person has a medical concern, he or she should consult with an appropriately licensed physician or other health care worker.